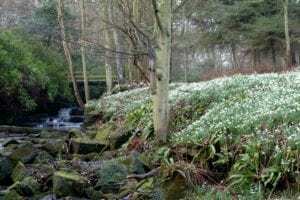 The annual snowdrop festival in February and early March is a key time to visit Cambo and enjoy the thousands of white blooms from the walled garden along the burn to the sea. Visitors can enjoy a walk in the gardens and snowdrop woods daily from 10am with short tours of the snowdrop collection offered free with garden entry each Monday to Thursday at 1.30pm. Lots of snowdrop inspired activities can be found in our what’s on page. Cambo is world famous for snowdrops and home to the national collection of snowdrops, with over 350 varieties alongside the thousands of nivalis at home in the Cambo woodlands. There have been snowdrops at Cambo for many years, but it was Lady Magdalen Erskine, an avid gardener, who really encouraged their proliferation from the 1930’s. 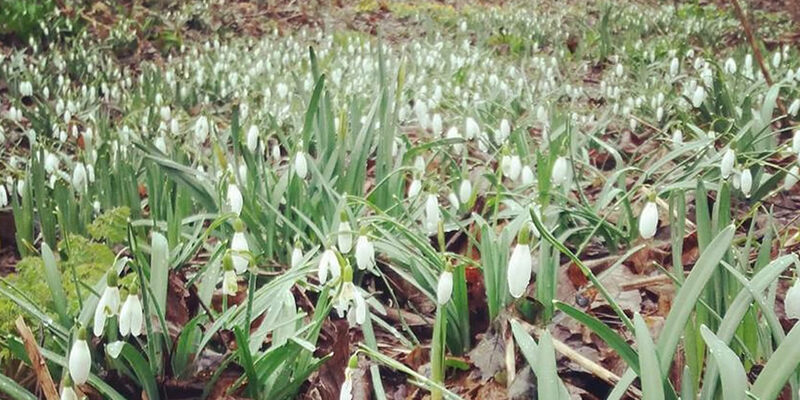 As snowdrops require thinning-out and redistributing every three to four years, Magdalen and her eight children spent hours each year digging, dividing and replanting the snowdrops in the 70 acres of woodland. In 1986, avid galanthophile Lady Catherine Erskine, having read articles advocating planting snowdrops “in the green” in spring-time rather than the traditional dried bulbs in the autumn, launched her now renowned mail-order snowdrop business. Over the years, Catherine’s own collection of specialist snowdrops has grown steadily and is now viewed as the national collection, with over 350 varieties growing in our gardens. We also offer a very limited number of these for sale online, depending on their availability.